This Class is taken by Simon Turton (5th Dan) and is held at the impressive English Institute of Sport which is used by a wide variety of high performance athletes. The class is focused on Kyorugi (sparring) and is ideal for students looking to compete, or for those with a good level of experience and who wish to further improve their fitness levels. 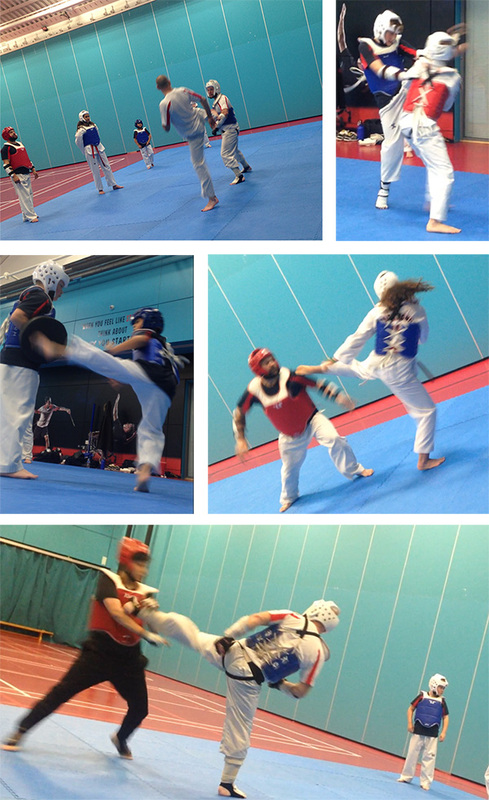 Sessions tend to include a combination of padwork, sparring drills, competition-specific techniques, flexibility training and free-sparring. A number of our students regularly enter both one-to-ones and open competitions in and around Yorkshire and the surrounding counties. We actively encourage those students who do want to compete and our instructors give up their time for free to attend and coach all students taking part. This is a high-intensity class for students who are already well-versed in the basics of Taekwondo and have confidence in sparring and full-contact training. Both adults and juniors interested in competition sparring, or who just enjoy Kyorugi -specific training, are welcome to attend but we recommend that beginners start with one of our other classes first. Classes for all levels are available at this same venue on Wednesdays and Saturdays. This class is held at the prestigious English Institute of Sport, Sheffield: A venue that has everything you would want from a first class training centre. For more information on this class, or any of those held at the EIS, contact Simon Turton on 07825 553639.